Looking at my students work has inspired me to look back at some of my early successes developing techniques to turn polymer clay on a lathe. I initially approached it as if it were turning ceramic clay, and like clay spinning on a wheel, shaped the raw clay as it moved away from me. This ment turning the lathe around and working from the back side. My first efforts used a drill press rather than a lathe. Working freehand and without a tool rest I centered and then moved the clay along the length of the mandrel to which it was secured. 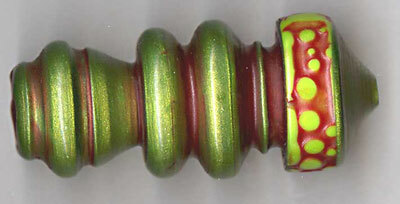 Here are a few shots of some such beads from 2004. Some of the color comes from a wash of liquid polymer. 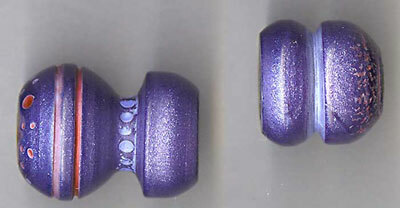 These are early examples of texturing techniques combined with my lathe turned beads. These final four shots are of more recent beads. After learning how to form raw polymer as it turned I learned that I could use other ceramics techniques and actually remove both raw and cured material with ceramic trimming tools. Still turning freehand with the lathe backwards, this gives me much more control. The first two beads are turned and textured, the third are turned mica clay ingots, and the last is a turned and textured polymer clay bead with fine silver (pmc) endcaps. 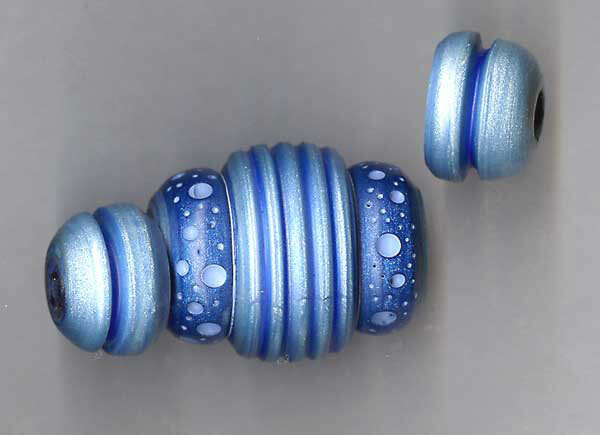 I’ll be finishing off my three day stint at the Bead & Button Show by teaching my Lathe Turned Polymer Beads workshop. I can’t wait to send off new students down this same path of discovery. There are still spaces available in Sunday’s workshop. Grant your work is so amazing! It is the kind of thing that makes you stop, ignore all things that may be distracting, and look. Really look. Like you may not get the chance to see something quite like it again! Thanks Cindy–very kind. I certainly try to transmit the quality of discovery that I feel when making things. Glad they got your attention!